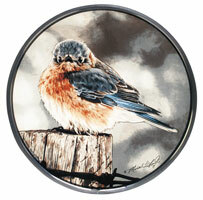 In the photographic community, the "shot heard round the world" is generally agreed to be Michael Smith's lucky click of the camera, capturing a puffed-up, ticked-off, thoroughly annoyed Mad Bluebird that captured the hearts of thousands and appeared on the cover of National Geographic Magazine. Every bluebird, angry or not, deserves a mate. The subtle coloring and disdainful haughtiness of the Mad Bluebird Companion makes her the perfect complement to the Mad Bluebird. This wifely bluebird radiates feminine serenity. Though puffed-up like her mate, she seems almost bemused at his temper, and confident of her own abilities to remedy the situation.